The chimp is our closest relative, sharing 98.7% of our DNA but it also shares with us a very complicated mind, and, just like us, chimpanzees are prone to both violence and brilliance. Living in the rainforests and savanna grasslands of Africa, the chimp, sometimes called the "common chimpanzee", separated from its close relative the bonobo, sometimes called the "pygmy chimpanzee", about 1 million years ago, and never looked back. The lifestyles of these two species differ greatly. Chimpanzees live in large groups of 30 to up to 150 individuals called "communities". Within these groups are fluid, often changing sub-groups of friends and family. The social structure is sometimes referred to as a "fission-fusion" society. The group usually has one or two dominant males, who gain their leadership through sometimes very violent displays and fights between rivals. Males will "display" by screaming and running through the forest grabbing sticks to strike the ground or the trees with, throwing rocks, and rattling bushes. There is more than just force involved in gaining leadership though, and in order to become the dominant male, support from other community members, especially older females, is critical. Lots of politics is involved and coups may be planned and developed by young males for years. Once dominance is obtained, all group members must show submission by crouching or bowing or presenting their rump. The dominant male will assure them with a pat and the submissive chimp will often actually kiss the dominant males hand in a very "human" gesture. 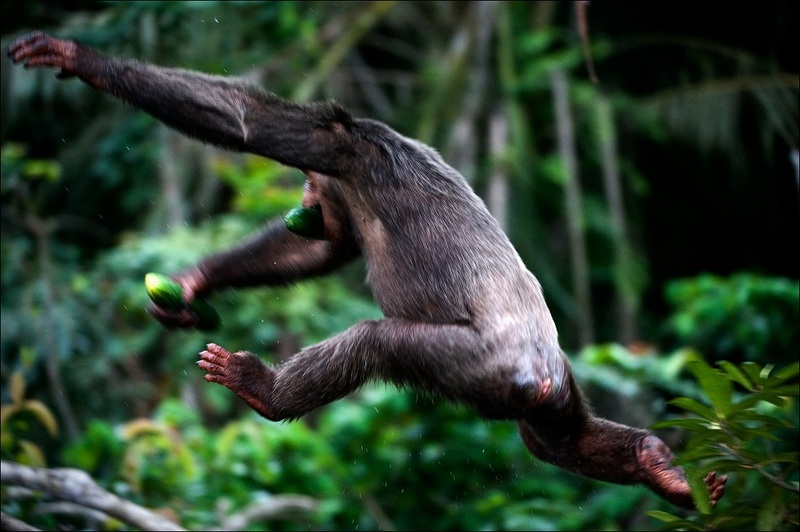 Most chimps spend equal amounts of time in the trees and on the ground, where they are true knuckle-walkers. The chimps arms are much longer than its legs and it walks and runs comfortably on all-fours. Occasionally, especially when carrying something, chimps will stand and walk on two legs, but this is neither typical nor efficient. Once numbering in the millions throughout Western and Central Africa, chimpanzees are now critically endangered in the wild due to the destruction of their natural habitat. It is widely believed that the ancestor of human beings split with the common ancestor of bonobos and chimps more than 4 million years ago. Subsequently, the ancestors of chimps and bonobos split about 1 million years ago, most likely as a result of the formation of the Congo river which divided the population. 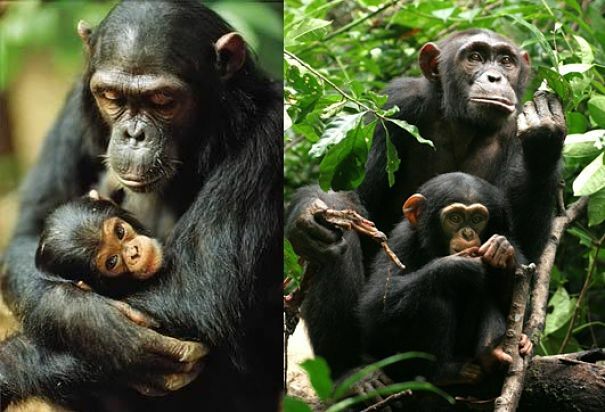 Researchers sequenced the genome of the chimpanzee in 2005 and the bonobo in 2012. What they found is that they still share 99.6% of their DNA, while human beings share about 98.7% of our DNA with both chimps and bonobos. But it is the behaviors that we share with these great apes, particularly chimps, that is truly intriguing. Until Jane Goodal's groundbreaking research began in 1960, it was firmly believed that human beings were the only creatures that used and (most importantly) made tools. This belief was one of the foundations for the very concept of "human being", and served as a neat and simple distinction. Over the decades, however, we have come to discover that all of the great apes, as well as numerous other animals, not only use tools, but alter items to use as tools. Along with tool use, there are some very specific and unique behaviors that we share with chimps in particular To gain a glimpse into the complexity of the chimpanzees mind, you must only look at their intricately woven social lives Humans and chimps live in unique social communities with numerous small and frequently changing sub-groups. Chimp A may always build her nest in close proximity to chimps B and C, but eat her morning bananas in the company of chimps D and E, and walk to the watering hole with chimps F, G and H. Just as you may car pool to work with Melisa, eat lunch with Lorraine and bowl on a league with Josh and Tamara. The other great apes, the gorilla and the orangutan, do not have this lifestyle, but other highly intelligent animals like elephants and whales, do engage in this complex social structure, sometimes referred to as a "fission-fusion society". Our other similarity with chimpanzees is somewhat unfortunate. It is probably accurate to say that only human beings and chimpanzees have been observed taking part in what is referred to in the scientific world as "lethal coalitionary aggression." You could also call it war, but in the case of the chimpanzee, it involves stealthy, single-file patrol of their territory. Although it appears that there is sometimes a specific target in mind, it is more likely that the patrol may happen upon a solitary individual from a neighboring troop. When this happens, the silent cue of chimps attacks loudly and viciously as a single unit. They will take turns beating and stomping their quarry, and have been observed holding down unfortunate victims arms and legs. There is celebration, including chest-pounding and displays, and often there is deliberate mutilation of the living victim or the corpse. One aspect of these attacks that sets them apart from other animals who might invade rival territories, is that the war party of chimps does not raid any resources, they merely return to their own home ground, usually in loud celebration. This sort of violence is alarmingly regular, and it has been reported by the most respected researchers, that an astounding 30% of all chimpanzee deaths in the wild occur as a result of violence between groups. "Lethal coalitionary aggression is part of the natural behavioral repertoire of chimpanzees,” writes David Watts, of Yale University in New Haven, Connecticut. 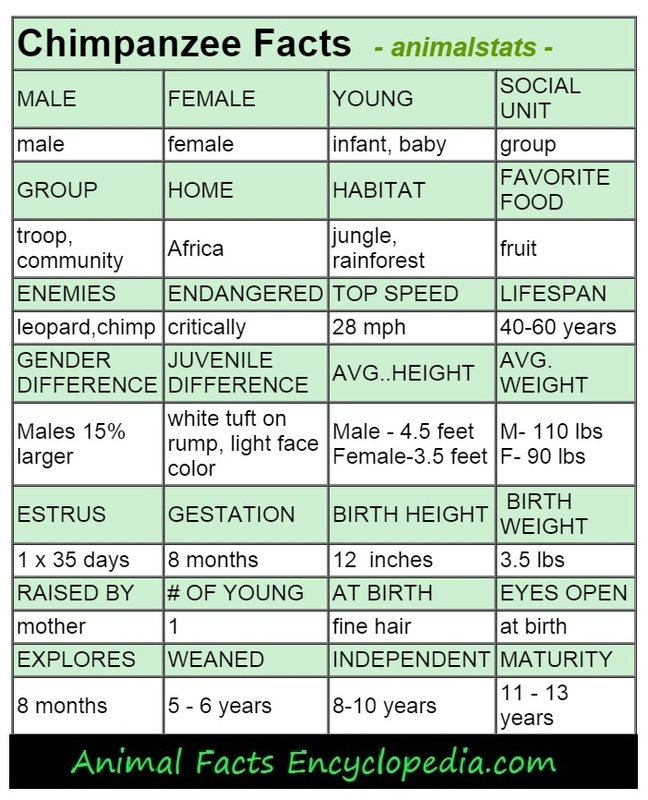 A female chimp in estrus may mate with multiple males in the group or she may stay with the alpha male exclusively. Occasionally, a male and female may form a loose pair-bond called a "consortship" where the female stays away from the group during her cycle and only mates with her chosen male. This may be a low-ranking male who has managed to woo a female through attentiveness to her, even while she was out of season. The bond is not usually very strong, and may only last a few months. The mother chimpanzee may stay in her nest with her infant for a few days before returning to the community. The community is always excited about the arrival of a new infant. Older siblings may be jealous, but usually show great curiosity and a desire to hold and care for the infant. Experienced mother chimps walk a delicate and wise line during the first few days of a new babies life, deciding who may view the infant, and who may touch carefully, but nobody may hold the baby, despite whines and pleas from siblings. The infant is in almost constant bodily contact with its mother for the first few weeks of life. If she is not cradling the baby, then it is tightly latched to her fur. 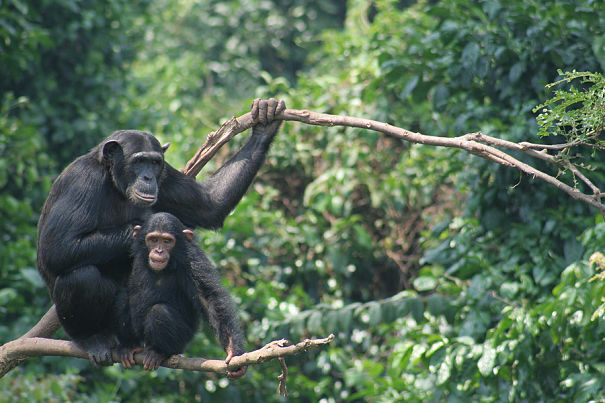 Infant chimps begin to support themselves and stand with their mothers help at about 4 months. By five months they come into toddler hood and begin ranging just a few steps from mom. As they grow, young chimpanzees form friendships and playgroups with the other kids in the community. They are incredibly noisy, boisterous, devilish and inventive children. They pick up the language of their community quickly, learn tasks and tool-making from their mother, and spend hours chasing each other through the trees. A female may have an infant every 4 to 6 years, and the family unit may be several siblings , youngsters and eventually grandchildren. 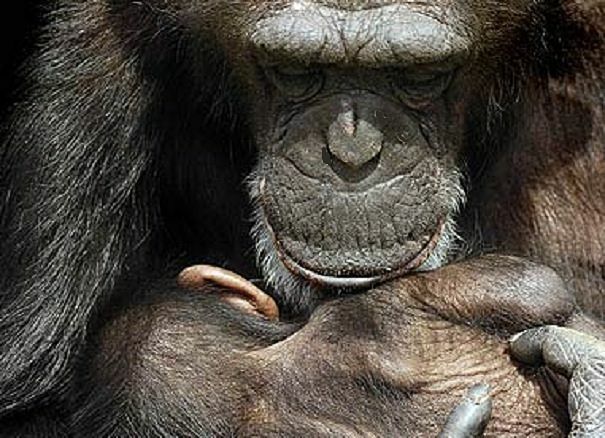 There are very strong mother-daughter bonds in chimp society, and they tend to stay close their entire lives. The mind of the chimp is like the mind of a gifted child, busy for input and stimulation, open to learning and change. Of all the non-human great apes, it is the chimpanzee, by far, that creates and uses the most diverse assortment of tools. Chimps trim sticks to fish for termites, they chew leaves into a wad that they can use to soak up water like a sponge, they use stones as both hammer and anvil to crack nuts and cut fruits, and one famous young male used kerosene cans he stole from a human campground to use in aggression displays that eventually earned him a dominant rank. Certainly the most exciting recent discovery of chimp tool making and use was observed in a group of chimps living in Senegal, Africa known as the Fongoli group. 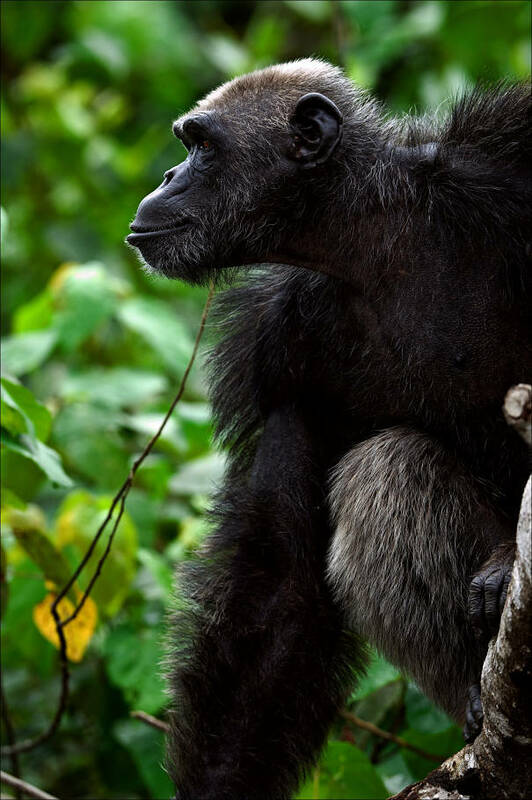 Researcher Jill Pruetz, assistant professor of anthropology at Iowa State University, US, has personally observed these chimps using spears to hunt bush babies and other small animals, and in one case, a chimp was observed to use his spear to thrust into a cavity in a tree. Eventually he successfully extracted a bush baby with the spear. This spear making is not simply picking up a stick and impaling an animal. 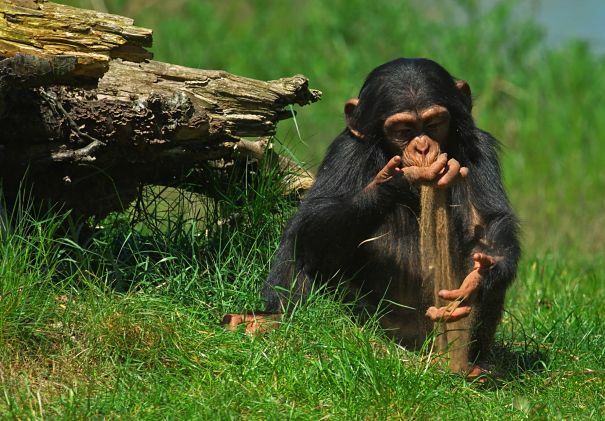 The chimps actually use four distinct steps to create their weapons. 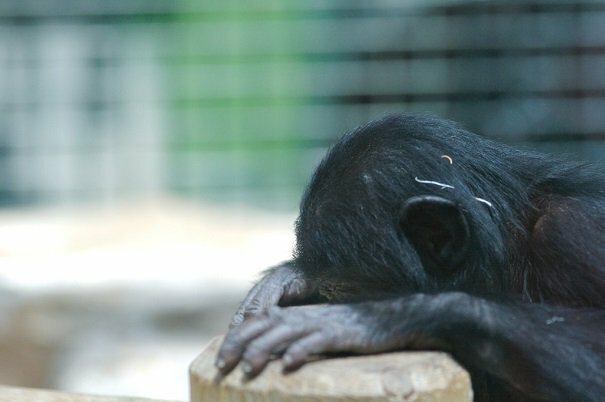 The United States is the only developed country in the world that continues to use chimpanzees in invasive experiments. Several countries, including Australia, New Zealand, Japan and all of the European Union member states have banned or strictly limited the use of great apes (chimpanzees, bonobos, orangutans, and gorillas) in research. In addition, several pharmaceutical companies have adopted policies against the use of chimpanzees in research. Because chimpanzees are our closest genetic relative, scientists once thought that they would be valuable in the study of human diseases, such as HIV. However, the small genetic differences between chimpanzees and humans actually cause chimps to react to illnesses in significantly different ways than we do, making them an unreliable model of human disease. 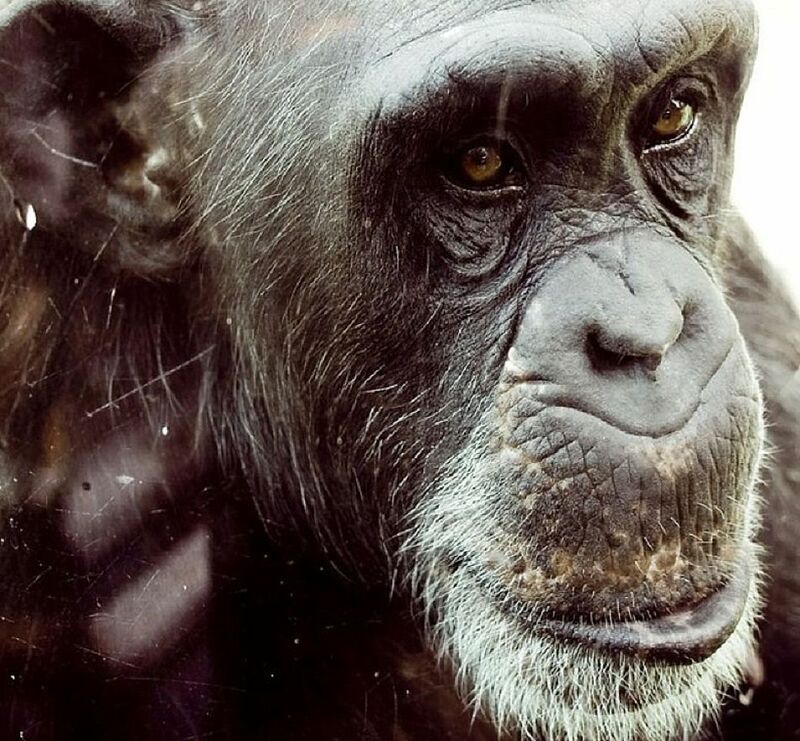 A report by the Institute of Medicine and National Research Council found that most bio-medical and behavioral research on chimpanzees is unnecessary, and could not identify any area of current bio-medical research for which chimpanzee use is essential. 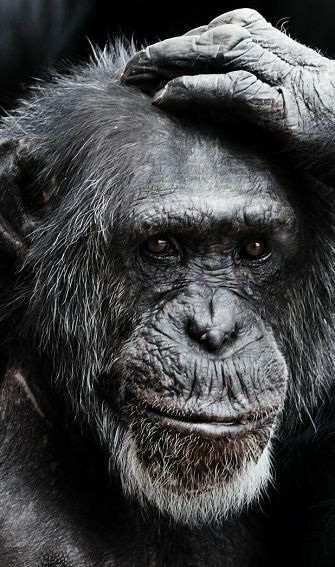 The report released in 2011, listed several available alternatives to chimpanzee use, and called for increased investment in the development of additional alternative research methods. 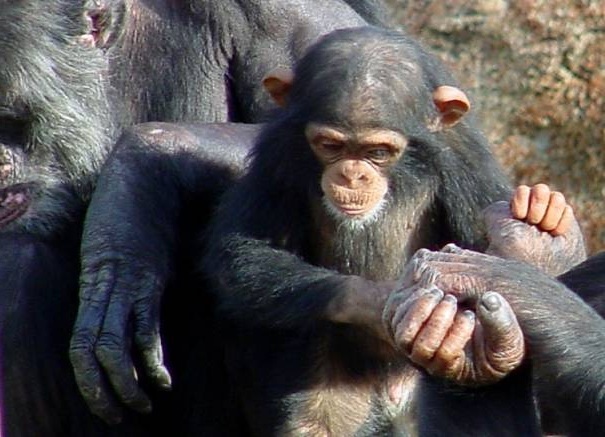 Chimpanzee society revolves around lots of politics, but also involves lots of physical touch. Grooming is a major part of the chimp community, and who-grooms-who is important too. Submissive chimps will groom dominant chimps to gain favor, but dominant chimps will groom submissive chimps to reassure them, and maintain a comfortable environment. Friendly chimps will mutually preen each other, straightening hairs and removing parasites, but will also, kiss, hug, pat each other and hold hands. A young chimp is in almost constant bodily contact with someone for the first 8 years of its life, and even as they head out on their own to forage or nap, chimp friends are always thrilled to see each other again and will shriek with excitement, hug, kiss on the lips and pat each other on the back, even if they just had lunch an hour ago. The chimpanzee is a very noisy animal, and spends allot of time communicating with many loud calls. The most common call for the chimp is the "pant-hoot" which is a sort of signature call. It is used to say "hello" and can be sent out long range to find out where others are. Each chimp has a distinctive "pant-hoot" and others know exactly who is calling when they hear it. Chimps use an astonishing number of hand gestures including begging for food with an outstretched hand, and waving away of an unwanted advance. Interestingly, chimps in the wild do not "point"
Many chimps in captivity use a pointing gesture, usually with all the fingers at once, to communicate with their human hosts, but pointing among chimps as a form of communication does not appear to exist. Finally, the chimp, like all the great apes, has an incredibly expressive face. The face is hairless to aid in recognition of expression, and the brow and lips are amazingly flexible. Some faces are similar to human expressions, but some are routinely misinterpreted by humans, in particular the chimp "grin" which is a sign of nervousness and even fear in chimps. It may, at one time, have meant the same thing for us, but evolved into an expression of joy. 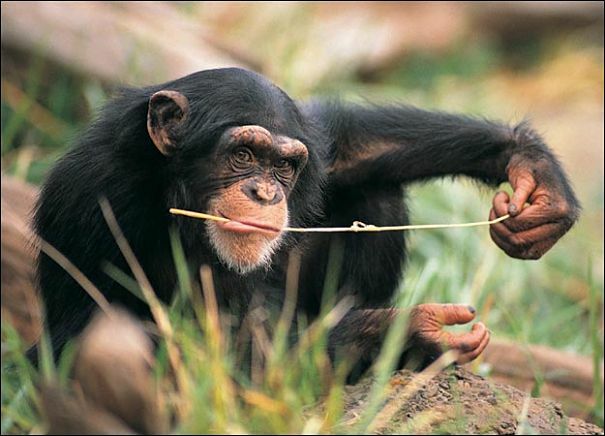 Chimps laugh as well, and have very playful and comical personalities. Young chimps will even reach out and play with baboons who share their energy and zeal for action. 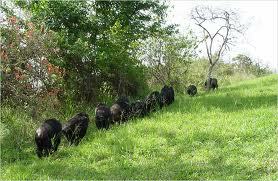 A group of chimps is called a "community"
Chimpanzees are one of the nosiest mammals on Earth.- Chimp Facts!